Looking for a child’s play set is easy. The hard part would be finding the most appropriate one. Getting them something that’s not only fun but for the very most, also educational. Conducting a research for that type of toy will bring you to a wide option of train toys. And that’s actually tiring and effort-requiring task as there are so many train toy products or train set manufacturers out there. To help out, we decided to make you a list of one of the major train wooden set brands, the Chuggington trains, to somehow narrow down your search and provide you with a bright and promising children’s play set. Some of you might not know but Chuggington train set is an inspired creation from the television animated train series. It involves so many train characters and most have been selling individual toys, collectibles and limited edition production to cater children’s educational toy kits. You’d find it hard to purchase them all individually but there are actually some items that come in a set. 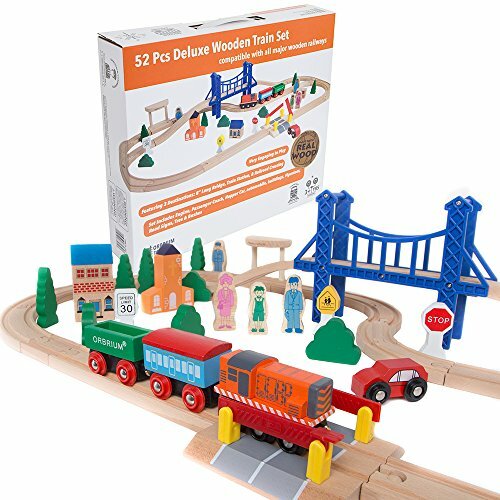 It is a great starting train set for beginners due to the fact it has all the necessary accessories to build an entertaining train layout and provide a non-violent, imaginative and creative play style for your kids. 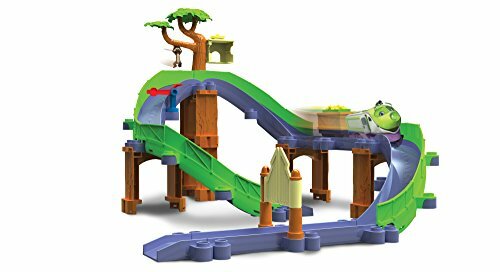 The combination of a beloved children’s train animated series and the love for trains, all made possible into one play set can give loads of fun time and entertainment. It won’t be like those ordinary educational or fully-featured play sets that easily bores young minds. The joyful time Chuggington train sets provide lasts for decades. It has also remarkable durability and a sturdier construction. Most of its parts and accessories are large enough to be a choking-hazard and kid safe. It also enhances logical and physical skills that are important in their development. The first train set item on our list would be the StackTrack Brewster’s Adventure Chuggington train set. The track’s design is built with great innovation. Instead of consuming a lot of space for a train track layout, this train set’s design will allow you to stack and expand the train track up which is actually a space saving feature. It includes a detailed instruction guide or manual that shows you to create multiple train track layouts. The set is recommended for children aging 3 years old and up. There are so many types of Chuggington sets of trains. The most common are wooden but this one here is called the StackTrack. It is made of die casting materials, a combination of durable plastic, metal and rubber. 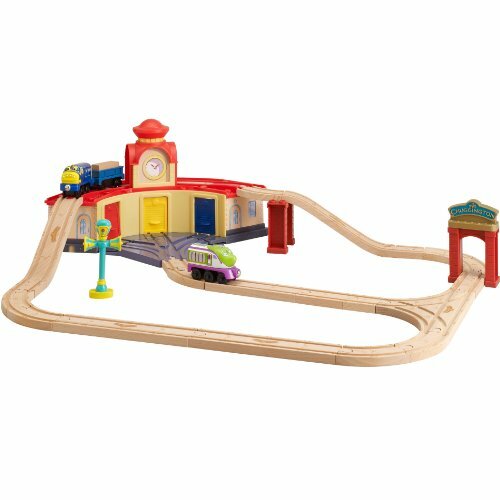 This set features a firefighting train station and toy with tracks of multiple layouts. The set requires some assembly which is actually quite fun as there are so many kinds of train set up you could do with the tracks. It is best to be played by children with age 3 and above. The next set is actually from Orbrium Toys but it highly compatible to run and connect with wooden Chuggington train set and all other major brands such as Brio and Thomas the wooden train set. The set features 52 pieces of hard and durable wood consisting of infrastructures, accessories and tracks which could actually complete your ideal train track layout. It does not include and small wooden parts. The set is kid-safe and kid-proof. It can withstand different play style and beating of a child, all this for a great and affordable price. There are lots of train track set up or layout design you can do using this set. There is actually a diagram on the back of the box where you can vary your layout but it’s optional. Here is a short video upon opening and setting it up. It shows you the actual appearance of the set. We do hope this does not only entertain you but also expects it to be quite helpful. Another great Orbrium Toys production, compatible with wooden Chuggington toy train sets. The tracks and all other pieces are a perfect fit. 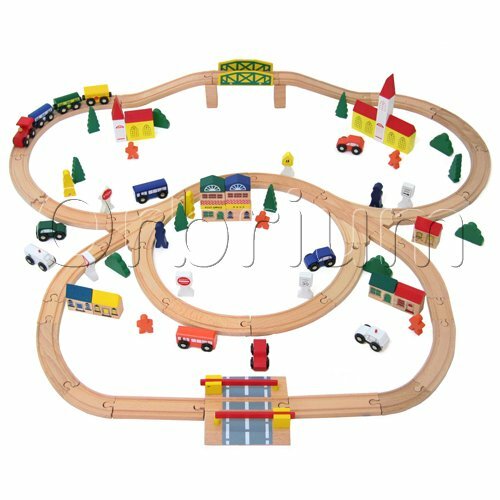 The size of the tracks are larger compared with other wooden railway set. There are 100 pieces of tracks, trees, infrastructures, cars and all other necessities needed to build an ideal track layout for your kids. It also enhances motor skills, logical and other basic skills needed for a proper child brain development. Orbrium Toys is actually known to build a large scale wooden set for a great and attainable price. The next chuggington interactive train set is a Stacktrack from TOMY. It features Koko on a Safari train adventure. Koko Chuggington is one of the famous characters in the animated train series. It is a smaller scale stacktrack that makes 2 alternate layouts. There is also a cute monkey figure and an opening gate included in the set. The durability of stacktracks are actually quite reliable. They are made from die cast materials. The design is intended for a train layout stacking up or expanding its height rather than consuming a large space. It uses catchy and attractive colors to add more fun and entertainment. For beginners, it is much advised to purchase a set, complete with table, play-board and other essential things in providing a great play environment. The next product is one of the finest Chuggington wooden train set. It has its own strong and sturdy table to where you children can lay out their train set. The table can also work as an activity table for arts and crafts or if your children have some homework or assignments to do. It is a complete set with tracks, play-board, train set, cars and infrastructure but comes at higher but reasonable price. There is some new Chuggington train set available. This one is the latest and complete set is all made from real wood construction. It is highly compatible from other major train brands provided that it uses standard size wooden railways. The train cars also use magnetic couplings to make things easier for your kids in terms of connectivity. The magnetic couplings also provide versatility as most wooden railways uses this type of couplings. You can easily purchase and extra set of train cars to extend the fun without worrying about any compatibility issues. This is an interactive and chuggington all around train set for kids. It features a fairly large train tracks with a stylistic elevation. The set includes a train car, pillars, a station and a durable plastic train track. It is all for an affordable price. This train set can work great if placed or laid out on top of a train table. It will provide long hours of imaginative play where your kids can enjoy and have a good time. The train uses bright and vibrant colors to add more fun. Most parts are made from strong and non-toxic plastic and is built with great sturdiness. It can last for a long period of time and extensive play. This set will require you a few double-A batteries to make it run which is unfortunate because it is not included in the set. For an all new chuggington train sets, this one is top notched. It is actually the most expensive Chuggington set you’d see being sold in the market. It comes with nice light and sound features. 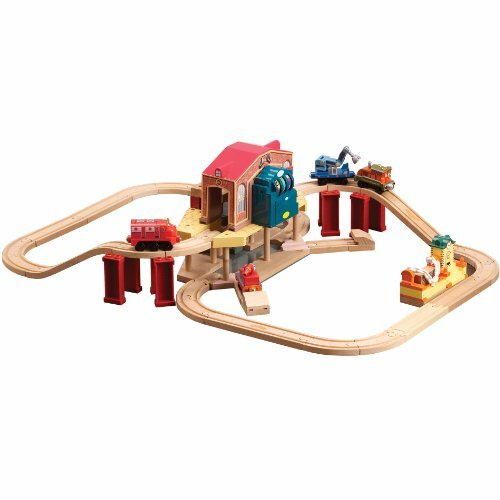 This rescue train set is compatible with all other major wooden railway brands. The set is on a higher quality among all other Chugginton train set. You’d actually see exceptional details and high standard durability upon one look. The set only requires 2 pieces of double-A batteries to make it fully functional. The set includes a few pieces of train cars and its own wooden tracks. The size of the tracks is fairly large and is designed to be laid out neatly. The craftsmanship used to create the wooden parts is also superb. You’d see a smooth finish especially on the tracks and most of its edges. 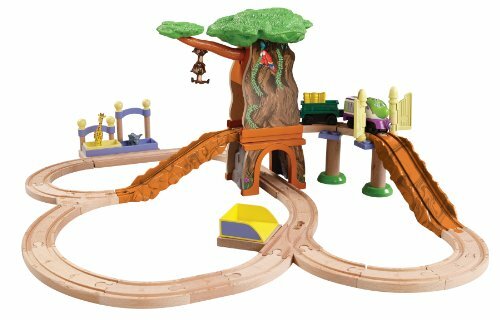 This is another Chuggington Safari train set that features Koko. It is far larger to the previous Koko Safari set. There is a 2-in-1 tree with a branch that your kids can actually push down to hear parrot, monkey and other jungle sounds. It comes with a Koko train engine car and one small but versatile train car. The train set uses magnetic couplers to make it compatible with other wooden train cars from known brands. It also features a food loading system where your kids can easily load up food on the cargo with a single push of a button. It has its own free tracks made of wood and perfectly strong and fits other wooden train cars. Chuggington sets features you Brewster and Zephie. Both are a famous character in the actual animated train series. The set can be availed at a low and affordable price. It includes several pieces of train cars and only requires you a single double-A battery to make it run but being sold separately. The train pieces are all made from strong, sturdy and non-toxic plastic which is child-safe and not at all hazardous. It has comprehensive design and details. The train cars use fun and wonderful colors to make it more attractive to children. You can actually use its color technicality in improving your kids identification skills. They can both learn and have fun, playing with this set. The next set is one of the few simple but elegant looking, chuggington trains sets. It features Wilson, a great Character in the Chuggington train series and a turn-table in the middle to where Wilson can easily change its course. It is an affordable set that gives long hours of fun for children. The train layout features a train station in the middle along with the turn-table and a simple oval track. The tracks are made of strong and sturdy plastic than can hold Wilson smoothly as it circles around the tracks. It is actually a perfect fit as you won’t see any derails or falls as Wilson goes. The last item on our list of amazing Chuggington train set would be a 100 pieces wooden train set from On Track USA. 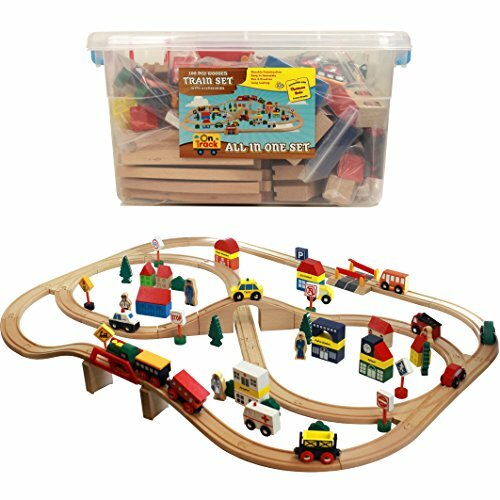 It features 100 pieces of wooden train parts and accessories that comes in a nice handy and clear plastic container or bin. 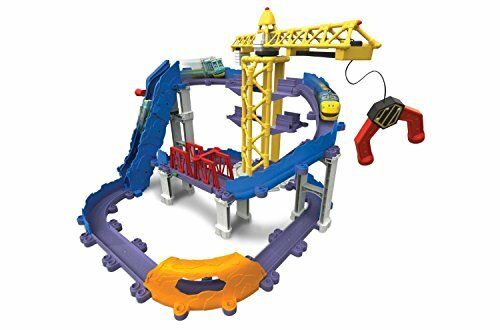 The set includes a bundle of train tracks of different types and sizes, 2 sets of bridges and countless cars and buildings to provide your kids with wide imaginative options. There are only a few of this large set left, if you plan on purchasing a nice starter train kit with all the things your child need, then this would be a great choice for you. Regardless of what type of toy you want your kids to have. It is important that you conduct a research to and maintain some good product criteria such as the product’s durability, effectiveness, safety, price, etc. and the most efficient way to know whether or not a product passes that standard would be reading reviews, scanning through customer’s feedback, finding out the product’s ratings and more. A train set for kids somehow passes most of this criterion’s that is possibly why it is among the top list of viable toys that are highly educational and beneficial for kids. The Chuggington train set is only one of the few major brands to where you can start your search. There is actually a ton more out there but somehow, we hope that this list would help you in sorting out what kind of play set you will provide for your kids. You may find it incomplete but the list actually contains only the best-selling and is feasible enough to be considered as a practical investment.